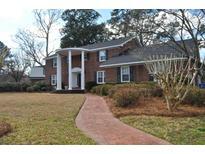 Below you can view all the homes for sale in the Sandhurst subdivision located in Charleston South Carolina. Listings in Sandhurst are updated daily from data we receive from the Charleston multiple listing service. To learn more about any of these homes or to receive custom notifications when a new property is listed for sale in Sandhurst, give us a call at 843-306-2224. Public play park, basketball court, tennis courts, and baseball field are a two-minute walk. MLS#19009985. Smith Spencer Real Estate. Both bathrooms rooms have been beautifully renovated with quartz countertops, tile flooring, fixtures, vanity hardware, tiled tub/shower combo with recessed tile niche. MLS#19009507. Front Door Realty. Large corner lot and well established neighborhood. MLS#19007648. Elaine Brabham And Associates. You will love the newly renovated bathrooms, 3 bedrooms (one bedroom has been converted to a huge walk in closet/dressing room but the owner will convert back to a bedroom if you desire prior to closing). MLS#19006331. Trademark Properties, Inc.
Two UTILITY SHEDS WITH ELECTRICITY and separate garden area/dog run. MLS#19004704. Brand Name Real Estate. The large two car garage with new doors has plenty of room for storage and the laundry area has a large laundry sink for MLS#19004678. Intercoast Properties, Inc..
A downstairs bedroom with ensuite bath could be used as a master bedroom or perfect guest suite. A half MLS#19004058. Carolina One Real Estate.